Bathing a puppy for the first time can be a frightening experience ...for you both! Follow our step by step guide on how to introduce your Cocker Spaniel to his first puppy bath to make sure he enjoys bathtime and isn't traumatized for life! When bathing a puppy for the first time it's best it you take it slowly otherwise you may frighten your pup. The whole idea is to make your puppy think that bath-time is a lot of fun! Follow these seven easy steps and you'll have your puppy looking forward to being bathed in no time at all! It's probably better to begin bathing your puppy in the family bathroom (rather than the kitchen sink) because he won't always be this small which means you'll need to get him used to being in the bath at some point...it may as well be now. Place a non-slip bath mat into the bottom of the bath first so that he doesn't slip and slide, which could add to his anxiety. Don't run any water into the bath at this stage; the point of this exercise is to get your puppy used to being inside an empty bath. If he seems okay and not at all upset, give him a small treat and tell him he's a good boy. Let him play with his favorite toy for a couple of minutes, but don't worry if he's not interested in it. Just let him explore the bath. You can make it more fun for him by running your fingers along the bottom of the bath, tapping with your nails as you go, or tickle him gently under his chin or stroke his ears; anything to keep his mind off being in 'this big scary white thing'! If your puppy tries to get out of the bath or he cries, don't reassure him, (otherwise he'll think there IS something to worry about) simply distract him with a couple of treats and more play, and continue telling him he's a good boy. Why not climb into the empty bath with him for the first couple of sessions? Your goal is to have your pup play happily inside the bath for a couple of minutes each time to help him to understand that no harm will come to him; bathing a puppy is meant to be fun! Do this every day until your puppy is completely relaxed and happy being in the bathtub. Once he's okay with being in an empty bath, your next step is to get your puppy used to the sound running water. At this stage, don't run the water while he's in the bathroom as the sudden sound of running water, especially if it echos off the walls, may frighten him. Have someone turn on the taps (gently at first and then onto almost full stream) while you stand just outside of the bathroom door, holding your puppy in your arms. If he seems happy and wasn't startled by the sound of the rushing water, take him into the bathroom and let him see the water running into the bath. If he becomes anxious or uncomfortable, leave the bathroom immediately. Don't reassure him (otherwise he'll think he was right to be worried) just leave the room quickly and calmly and have someone turn off the taps and try again another day. Once your puppy is okay with the sound of running taps, run a couple of inches of tepid water into the bath and then turn off the taps. If he seems relaxed about it, place him into the warm water and praise him. Let him play for a couple of minutes or wriggle your fingers in the water to try to get his interest. When your puppy seems happy standing in a little water, (this may take a session or two) lift him out of the bath and run some more water (gently) into the bath to keep him used to the sound. Don't put him back into the bath until you've finished running the water; let him to get used to the sound in his own time. The next stage is to run the water while your puppy is in the bath. Bathing a puppy is fun! Place your puppy at the other end of an empty bath (away from the taps) and then turn on the water, very gently at first so you don't startle him, and then slowly increase the flow. Make sure the water doesn't get too hot otherwise you may scald him; keep it at body temperature as you would for a baby. If you prefer to use a spray for bathing your puppy, make sure you have the spray facing away from him when you turn on the water otherwise you might frighten him. Your aim is to get your puppy used to the feel of warm water and to hearing it run and splash around him, without feeling anxious or frightened. If he seems uncomfortable at any stage, turn off the taps to see if he settles down before trying again. If he doesn't settle simply pick him out of the bath, wrap him in a fluffy towel and try again another day. I'm ready for my bath now Mom! 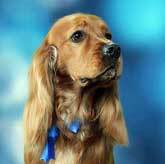 Your Cocker Spaniel should by now be happy with the sound of gently running water while he's sitting in the bath. Now we need to get him used to the feel of the water on his coat. Ask him for a paw. When he gives it to you (awww!) place your hand underneath for support and, with the other hand, gently scoop us some water and pour it onto his paw. Let him see where the water's coming from, let him feel it running onto his paw. He may try to drink it, but that's okay as long as there's no doggie bath bubbles in it! Gently run water from your hands over his coat. Take is slowly and gently, you don't want to startle him. 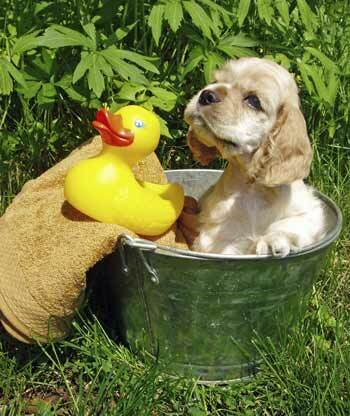 You never know, he may take to his puppy bath like a duck to water, in which case you've cracked it! Don't forget the whole point of bathing a puppy is to have a clean (relaxed and happy) dog. Be prepared to get wet and soapy, if not a little grubby! 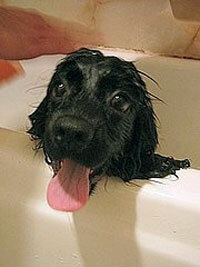 Now that your pup is happy in the bath and in water, it's time to get him clean. 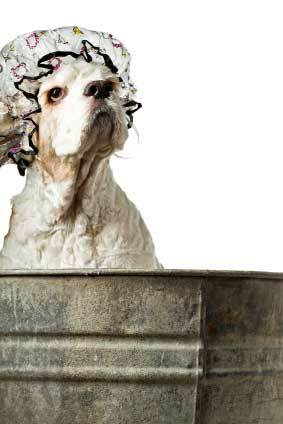 Rather than repeat myself, why not take a look at these guidelines for bathing your dog? You'll find lots of helpful advice and information on bathing your Cocker Spaniel as well as a useful list of bath time essentials. When you've finished bathing your puppy, don't worry if he just sits there - he may be slightly shell-shocked, especially if this is his first bath! It's always best to dry off your puppy with a soft fluffy towel but as he gets older and grows feathers, this won't be enough. This is the time to help your puppy get used to the sound and feel of a hairdryer. He may already be familiar with a hair-dryer if you have used one whilst socializing him. If he is, you can finish drying your puppy with a hair-dryer. Never use the highest heat setting; always use the coolest, or a warm setting on your hair-dryer. Don't hold it too close to your puppy as the heat may burn his delicate skin. Once he's been bathed and blow-dried; your little furry bundle will not only smell and look clean but his coat will be shining and feel soft and silky to the touch, just how a little puppy should feel. Puppy bath-time should be fun, let his first experience be a happy one! Bathing a puppy can make tats and mats worse (if there are any) and that's why it's always best to get into the habit of brushing your puppy before you bath him to remove any tangles or matting first. Although at the moment your Cocker puppy will be fairly easy to brush, when he's fully grown his coat will grow longer and will develop feathers, which will attract dirt, leaves, burrs, twigs and other sorts of debris, all of which can cause tangles and matting. If you'd like to read more about brushing an adult dog, simply follow the link.